I love knowing I’m coming home to a warm bowl of soup after a long day, especially when it’s getting chilly outside. Oklahoma weather is unpredictable at best. For example on a typical day it might go a little like this: wake up to a frosty cold morning with a possible warm and windy afternoon, then any where from twenty to thirty degree drop in temp as soon as the sun goes down. It’s hard to plan what to wear, let alone what to eat. 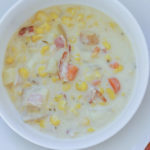 That’s why I make this Crock Pot Corn Chowder at least once a month. It simmers all day, and then it’s ready to serve when I’m ready to eat! 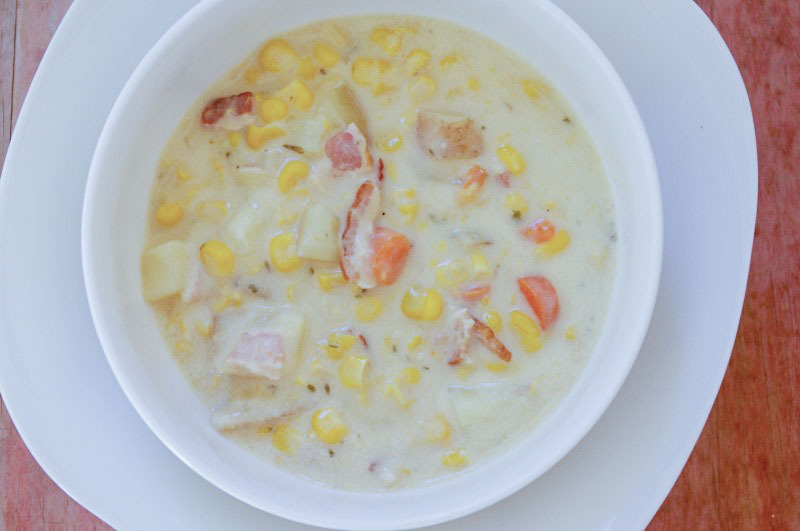 Check out the chunks of tender carrots and potatoes with all that sweet corn. It’s such a delicious combination! And there’s no way to overlook those savory herbs and hickory BACON! The smokey bacon flavor melds into every single bite. It just doesn’t get easier than this. 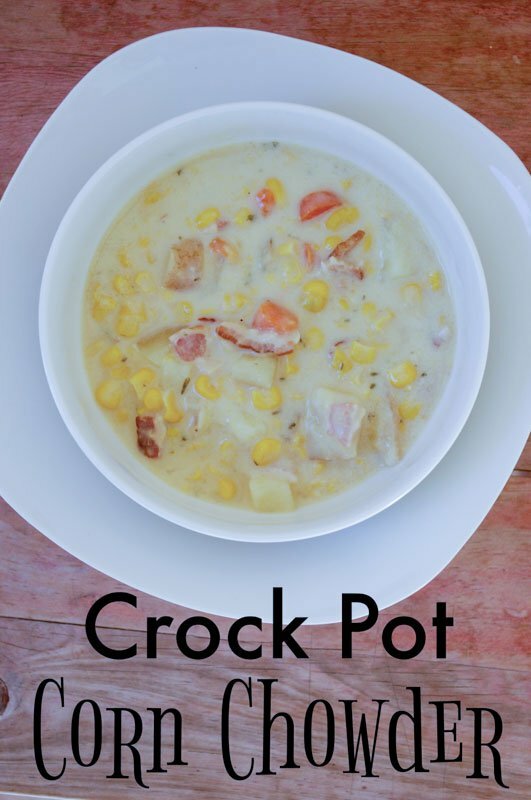 Place everything in the slow cooker EXCEPT the evaporated milk, cornstarch, and butter. You’ll save those for the last half-hour of cooking. This helps to thicken the broth, and take it to the next level of richness that we expect from our favorite comfort foods! 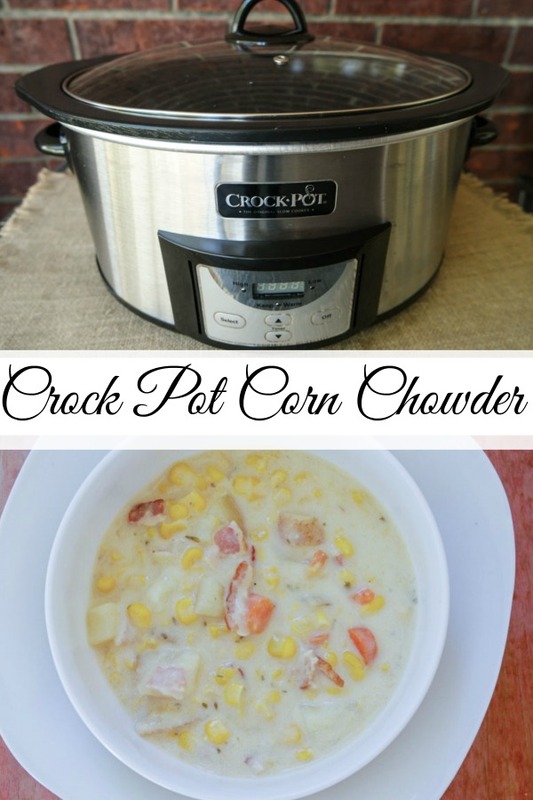 Place all ingredients but the milk, cornstarch and butter into the crock pot. Add just enough water to cover all your ingredients. Cook on low 7-8 hours until veggies are softened. Combine the cornstarch and evaporated milk Stir into the crock pot with the butter and cook another 30 minutes.